Crowds of students eat at Gardner-Webb’s cafeteria daily, and many opt for the food in Mac’s Grill where they receive their eggs, burgers, sloppy joes or hotdogs cooked to order with a complementary smile or a “how are ya?” from the chef in that area, Randy Jones. What students don’t know is that Jones, along with the other cafeteria staff, wake up at 4:30 a.m. to be on time for work right before six. “What I like about it is serving y’all. It’s kind of a family deal here,” Jones said. Jones described how he enjoys making and serving food for his Gardner-Webb family. He said that because he sees most students on most days and because he knows exactly what they want to eat, he has a good relationship with them. 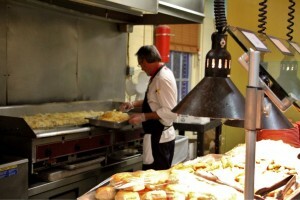 He has worked behind the counter of Mac’s Grill for about 11 years and has seen many students come and go. “I always consider y’all as part of my family. A lot of you are a [long] way from home. I just feel like it’s my responsibility just like it would be if it’d be my kids at home. I’ve got to feed y’all every day—that’s my job,” said Jones. With a stable, enjoyable job and a family of his own—a wife and four kids—Jones said he sees no reason to leave his Shelby hometown. He said that he tried to live in Florida but “moved right back here” after seeing how expensive life in Florida can be. Jones said that he started working in mills at a very young age, but because of the industry’s decline, he had to find a job in other fields. He worked at the local Ingles supermarket for about 9 years before quitting and becoming a part of Gardner-Webb. “Everyone works well here in the Caf. I like the atmosphere. It’s called work, but we have fun as we go along. It makes it better. You shouldn’t go to work and feel like a prisoner,” said Jones. He tried to think of something he would change about his workplace and finally—with a laugh—said, “The only thing I see is they need to name it Randy’s Grill instead of Mac’s Grill. 1 Comment on "Gardner-Webb chef talks about his grill"
I think the name Randy’s Grill would be great ! I’ve known Randy a long time and hes’ a great person and always greets you with a smile. I’m glad that he’s blessed and happy!